Here you will find our full selection of amplified telephones and accessories. 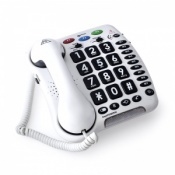 If you are looking for cordless amplified telephones, amplified telephones with answering machines, amplified mobile phones, television amplification aids or induction loops, please click here to view our full range of products. As always, if you require any information, please contact our customer care team. And remember, all of our prices include VAT and free postage and packing. VAT relief is available where the user is eligible.